My little boy Jacob is three and he is a typical little boy who is really into any kind of vehicles, he loves trucks, diggers and tractors and he will spend ages playing with his toy cars and trains. So when we were recently sent a box full of iconic Tonka toys which are available to buy from Asda, I knew these would be a big hit with him. Tonka is a name that I am sure we are all familiar with, the company originated in Minnesota USA back in 1947 and have been selling metal toys for almost 70 years. 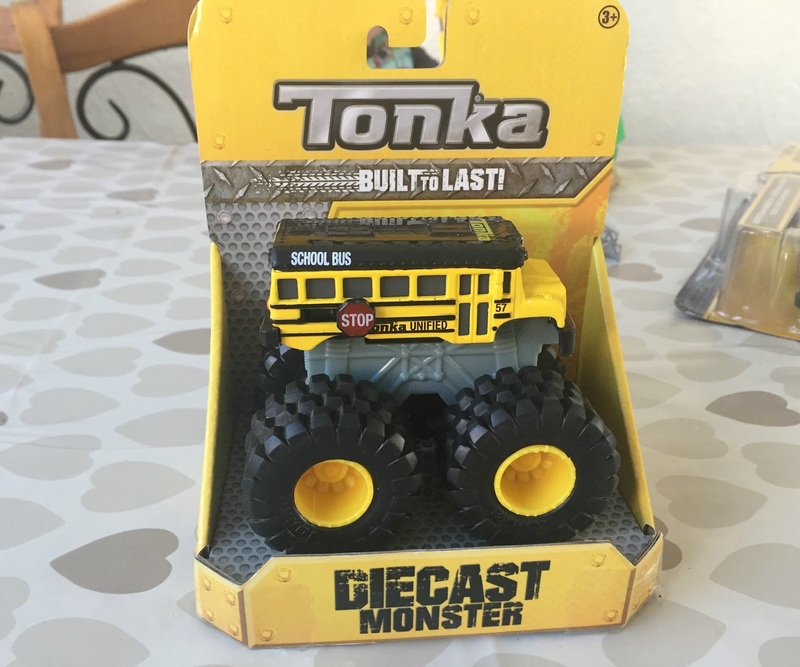 Tonka toys are built on the notion that 'a toy shouldn't break just because a child plays with it', they are built to be strong, sturdy and long-lasting. Making them perfect for boisterous little children like my own to play with. 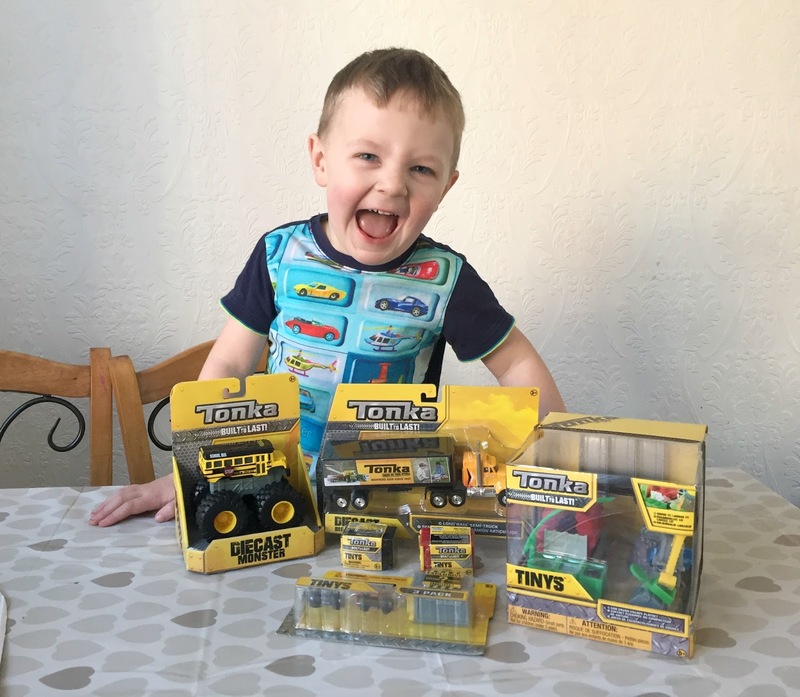 Tonka has recently started selling toys in selected Asda stores and to celebrate we were sent a box of toys to test out and see what Jacob thought of them. 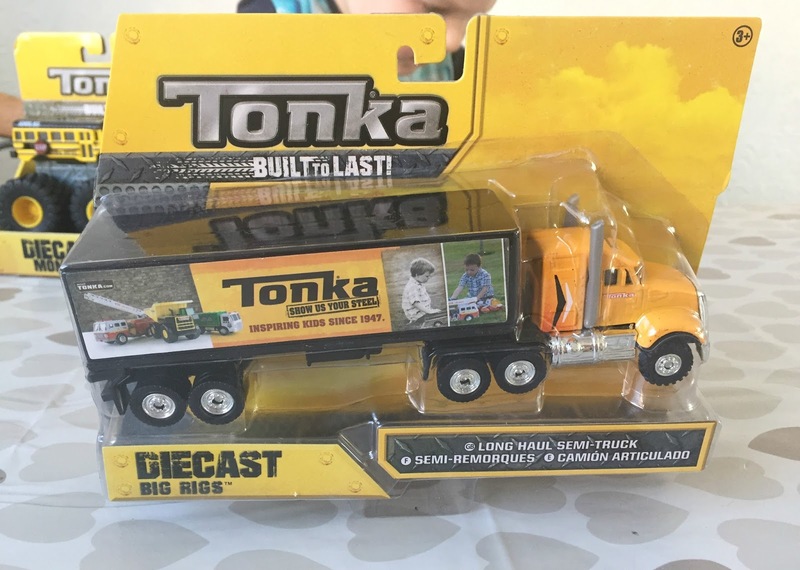 Tonka Diecast Big Rigs £6.99. 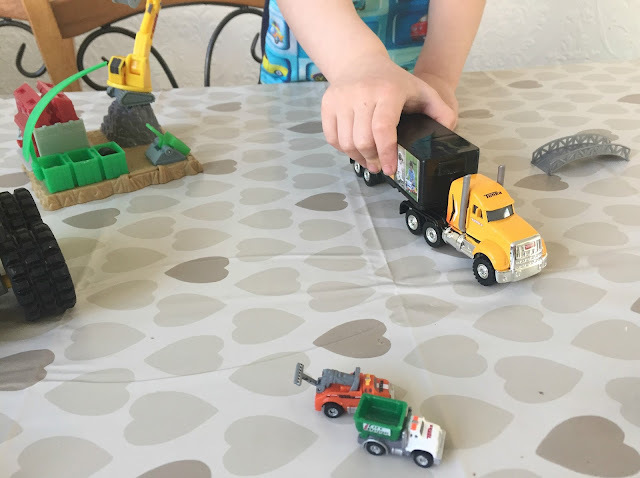 This die-cast truck looks so realistic and Jacob loves playing with it, he loves trucks. It has been played with a lot over the past week and it has been thrown, pushed and bashed into walls during playtime and it is still in perfect condition. Tonka Diecast Monster Truck £6.99 Another Die-cast vehicle that children will love playing with, monster trucks always look so impressive. Again this truck has been bashed and played with and is still in perfect condition. 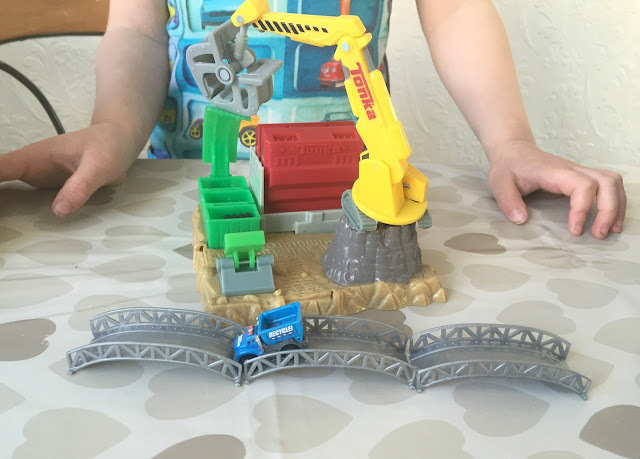 Tonka Tinys Mini Playset £9.99 We were sent the Car Crush Escape Playset, they also have a Blast and Dash Quarry one too. This is a small playset with little tiny plastic vehicles, it has little features like a bridge, a crane and a crusher. 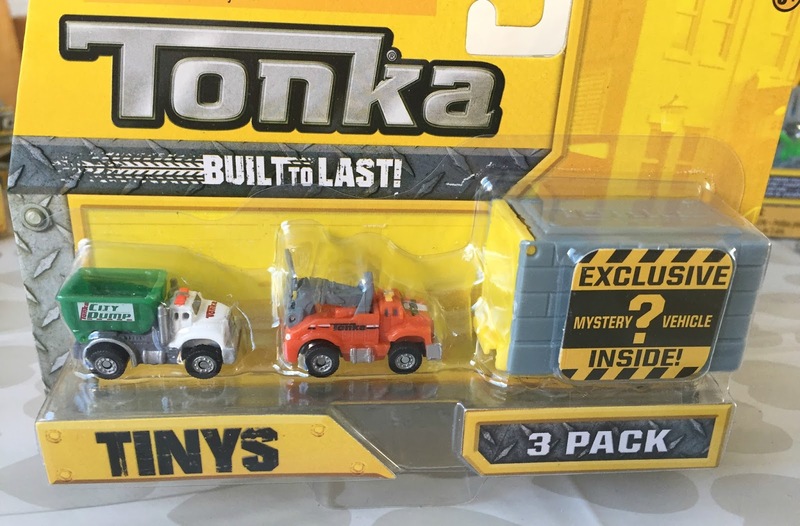 Tonka Tinys Three Pack £4.99. If your child loves surprise type toys they will love this, my children love blind bags (I'm blaming youtube) so Jacob was so excited to get this. It is a three pack of tiny plastic Tonkas and one of the three is a mystery vehicle. We got a dumper truck, recovery vehicle and the surprise was a black truck. These are ideal for playing with the mini playsets with. Tonka Tinys Blind Garages £1.99 each. We were sent two of these little garages and inside each one is a surprise Tonka Tinys. 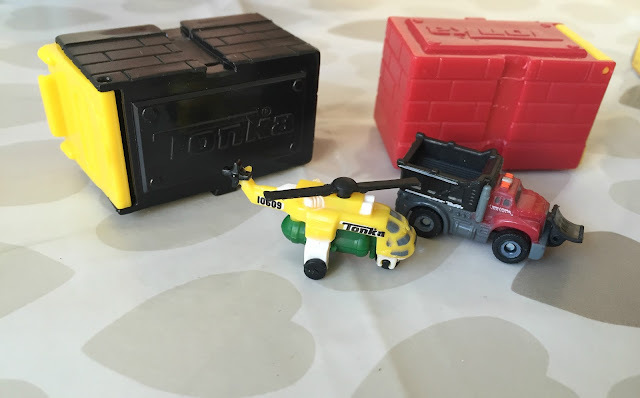 We got a helicopter and a snow plough inside and again these are perfect for using with the Tonka Tinys Playsets and they also make great pocket money toys. Jacob and his 4-year-old sister have both loved playing with these toys and the Tonka Tinys Blind bags were huge hits. Both my children watch people opening blind bags on Youtube and they are obsessed with blind bags and collectables, we have found that most of them are aimed at girls though and there is not many for boys, so I think these will be popular. All of the toys are really affordable too, the blind garages make great pocket money toys and the other items would make great gifts. You can buy the Tonka toy range from selected Asda stores priced from £1.99 - £9.99. You can watch a little unboxing video we made below. Disclosure I was sent these toys for the purpose of this review, however, all opinions are my own. Tonka toys are so brilliant - they are really robust we still have some here. Big fans of Tonka here, you can't beat them can you? We still have Tonka toys from my eldest (14) that our youngest plays with! It's a shame Tonka toys aren't built like they used to be. My brother was a big fan of them back in the 80s, and they were huge solid metal toys. Now they appear to be plastic, but delighted to see they still capture the imagination of young children. I think someone is REALLY happy with their new TONKA toys. I do remember Tonka toys being Metal and they used to last for YEARS. How times have changed. My boys are complete motorheads and love anything truck or car related. They would love these!